There were many local producers at the first meeting of the Anamoose Food Hub which was a pot luck held at the Anamoose Fire Hall on Sunday. It was interesting to hear where they all were from and what they grow or market. They were from Rolette, Rolla, Bowden, Harvey, Fessenden, Rugby, McClusky, Esmond, New Rockford, plus I missed a few. where they make bread plus pizza crusts on a grill and sell to customers. Merek and Julia Petrovic are remodeling the old Sally’s Upholstery building on Main Street for the Food Hub. They told of how their plan to start a Food Hub has evolved. They got financial help from the Anamoose JDA for the building and Bonnie Helm, JDA Director, has been helping them with their business plan. Merek redid the roof, gutted the upstairs, and plans on fixing up the main floor for the Food Hub with a certified kitchen in the back where value-added products can be made. An example would be making salsa out of tomatoes, or making jams, jellies, pickles. 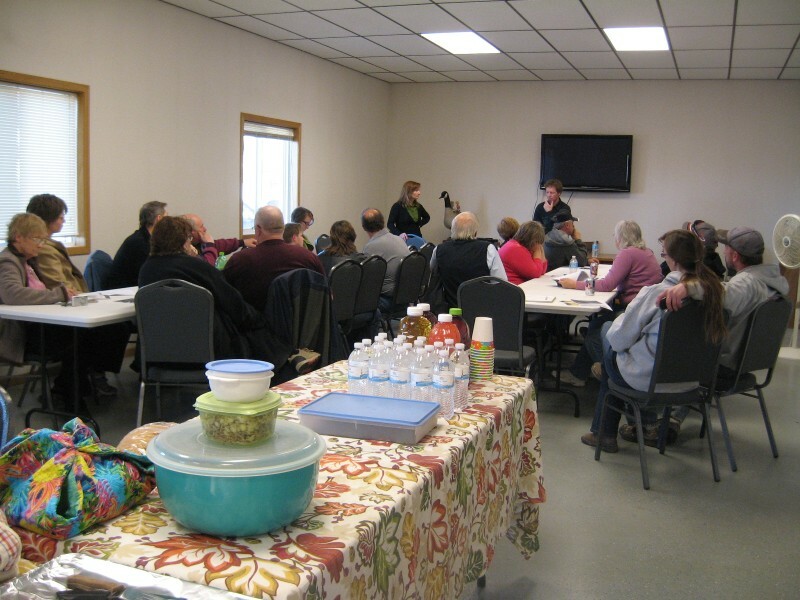 Rachel Brazil spoke on the Bismarck Community Food Coop at Bismarck. The Coop plans to open a new store in February, 2016. They are interested in forming a partnership with the Anamoose Food Hub that would supply them with locally sourced products year round to sell in retail and use in the deli. Many people want to make a living on gardening and the Food Hub project sounds like it could do just that for area gardeners. Good luck to you, Julia and Merek, Looking forward to seeing a food coop up and running in Anamoose. It will take a lot of work, but if anyone can make it happent….it would be the two of you!! That sounds like a fun time ! !